Cool, crisp nights and sun-warmed days. Brilliant sunsets and copper-colored leaves. Strolling around town with a hot apple cider in hand. Taking in panoramic views from high above the city. 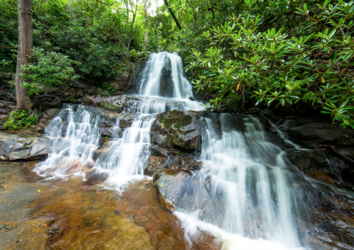 Can you tell that we think fall is one of the best times to visit the Smoky Mountains? 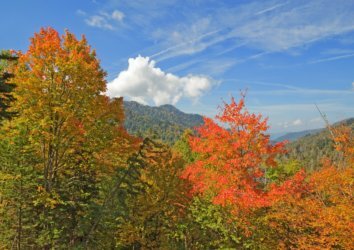 Keep reading: We’ve got the inside scoop of Gatlinburg’s sky-high places that take give you a bird’s eye view of our spectacular fall foliage. 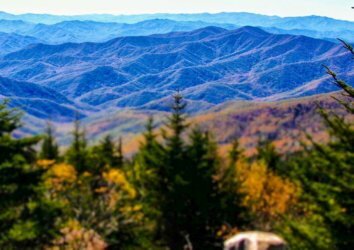 If the jaw-dropping 360-degree views of the Smoky Mountains and Gatlinburg don’t convince you, maybe some of the extras will: In addition to boasting an observation deck with sweeping, panoramic views (take advantage of the free viewfinders) the Gatlinburg Space Needle also offers an arcade, educational exhibits, a pizzeria, and a theater that features comedy hypnotists and magicians. 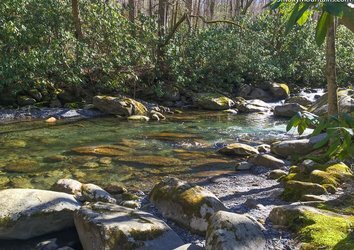 Views are exceptional during the day, or go at sunset and see Gatlinburg illuminated by glowing lights. Have you ever gazed 400 feet down at the earth from the open-air gondola of a hot air balloon? If the answer’s no…let’s change that this autumn. 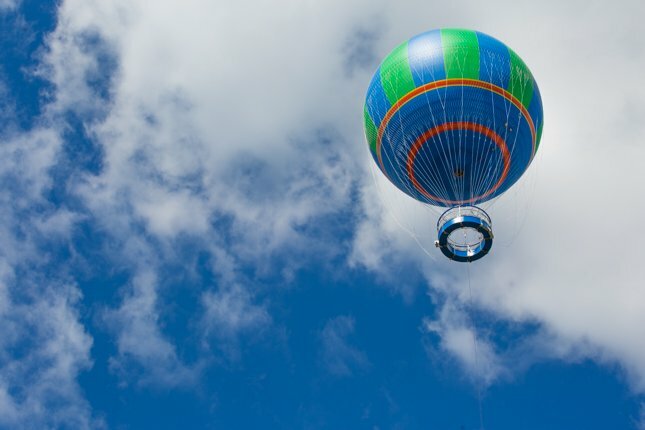 Located behind WonderWorks, Wonders of Flight offers thrilling, scenic rides in tethered, 102-foot-tall gas balloons. The FAA-certified pilot’s relaxed, friendly manner will put you at ease, and spectacular clear-day views become even more stunning when fall foliage arrives. Call before arriving to make sure that weather conditions are favorable. 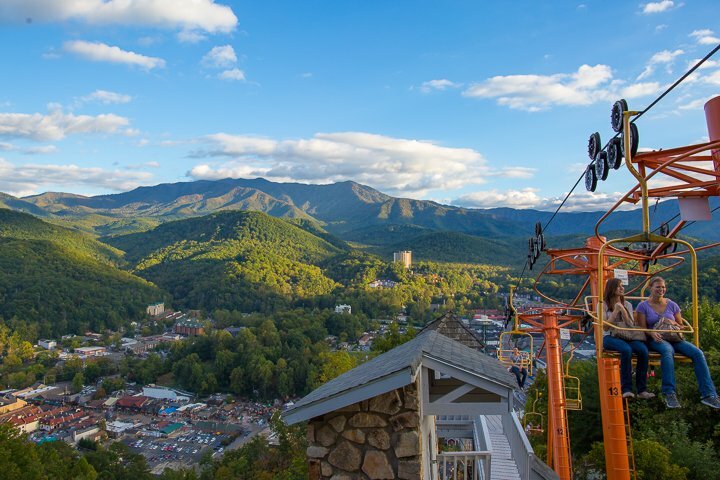 Don’t be fooled by its vintage charm: The Gatlinburg Sky Lift has been in operation since the 1950s and has an impeccable safety record. 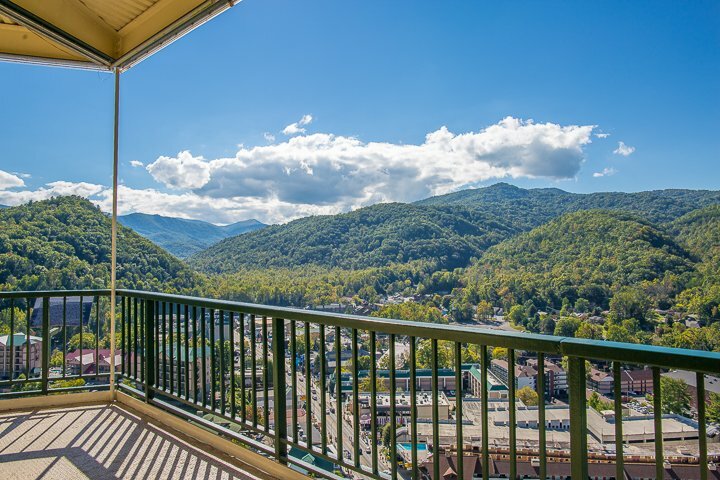 The number-one overlook in Gatlinburg, we love the scenic, 1,800-foot ascent of Crocket Mountain, where you’ll have the chance to take in beautiful views of Little Pigeon River, Bear Run, Mysterious Mansion, downtown Gatlinburg, and the surrounding mountains. It may not be for the faint of heart, but the Ober Gatlinburg Aerial Tramway offers breathtaking views on the 2.1-mile ride up to Ober Gatlinburg, a ski resort and amusement park with loads of family-friendly activities (hold your breath on the Alpine Slide, spot a river otter on the Wildlife Encounter, or go skating on Ober Gatlinburg’s huge rink). A mini history lesson on the history of the tram and nearby chalets is included. 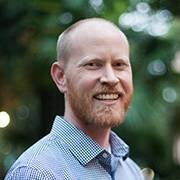 Bring your camera and make sure to get a window view! 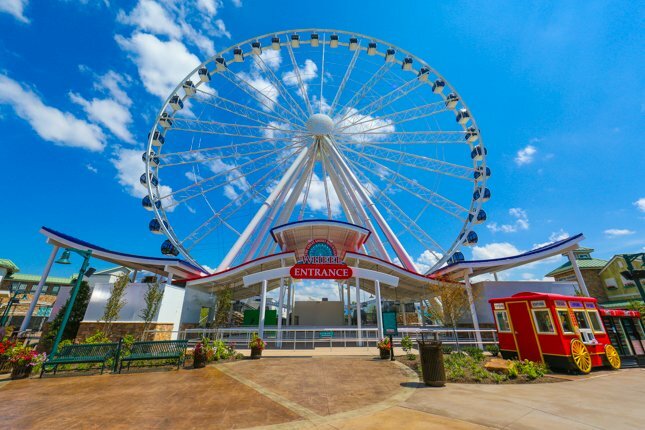 Rising 200 feet from the heart of The Island in Pigeon Forge, the brand-new Great Smoky Mountain Wheel is the perfect vessel for viewing the gorgeous fall colors of the Great Smoky Mountains National Park. 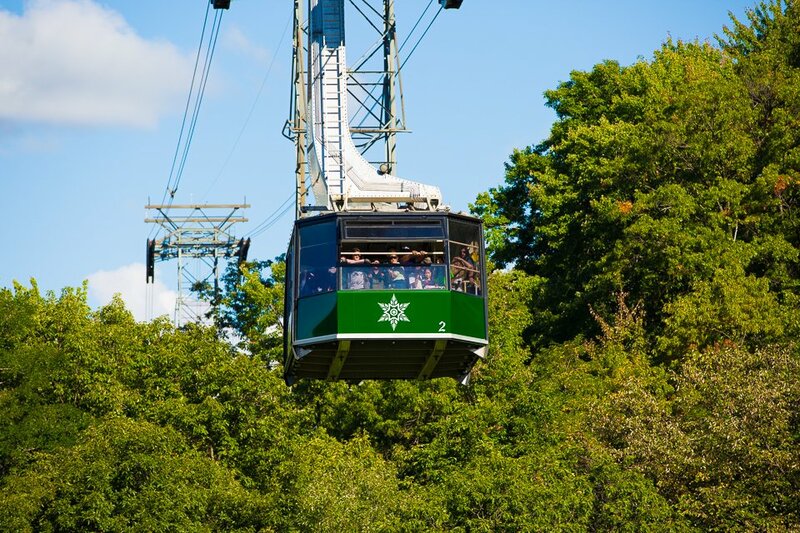 Clear-glass gondolas let you take in the miles-long view (and they’re enclosed, which means that you can sit back and take in the views without worrying about your blood pressure). Go at sunset and expect spectacular views; you won’t be disappointed. Feeling swanky? Spring for the velvet-lined VIP gondola and be escorted directly to the front of the line, gift bag in hand. 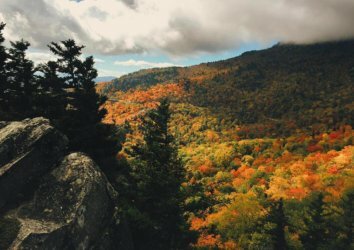 Have we convinced you to come see the vivid colors and breathe the fresh air of the Great Smoky Mountains National Park this fall? 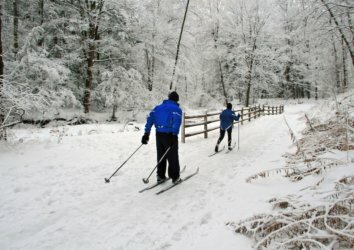 Check out our lineup of lodging ranging from cozy cabins to sprawling mountain mansions.